"The Greatest Trick..." is a commissioned work based on the movie poster for The Usual Suspects. I think it turned out quite well- the gummies all look highly suspicious to me. A group of bears is called a sleuth or a sloth. A group of polar bears is called a celebration. A group of gummy bears is called a snack. 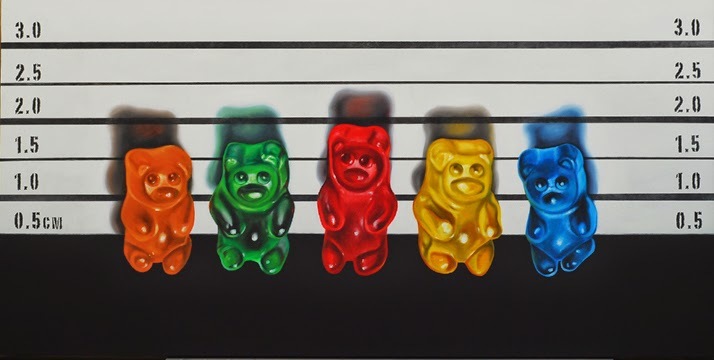 "A Scatter of Bears" is one of several new pieces that will be part of a still life show at Boston's Gold Gallery in April. The "Double Rainbow" series is a new set of 6x6 paintings that are on their way to the Gold Gallery in Boston. 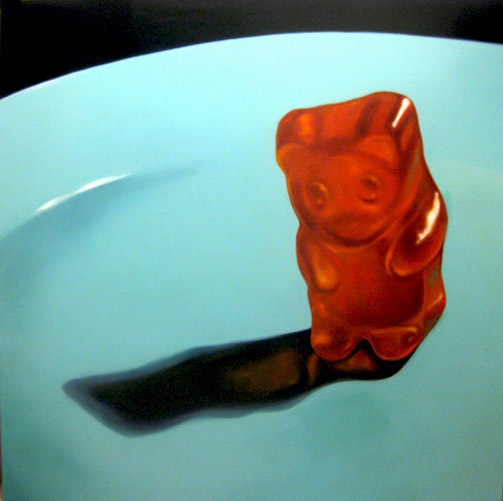 Giant Orange Gummy is off to the auction block! This piece will be auctioned off to support Visual Aid, a San Francisco organization that helps artists with life-threatening illnesses continue their creative work. Find out more about the auction and see her preview info here. 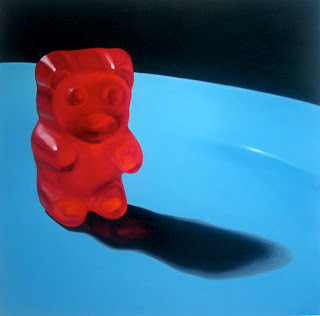 "Big Red Gummy" was done for a group show titled Big Red Shiny. I'm pretty sure she qualifies. The piece is 48x48 with the gummy being about 28" high. That's a lot of gummy. 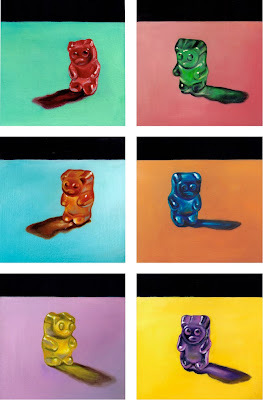 Reminds me of the gummy bears that grow on trees in the 1971 version of Willie Wonka & the Chocolate Factory. These guys were a commissioned set, each panel is 14x14. 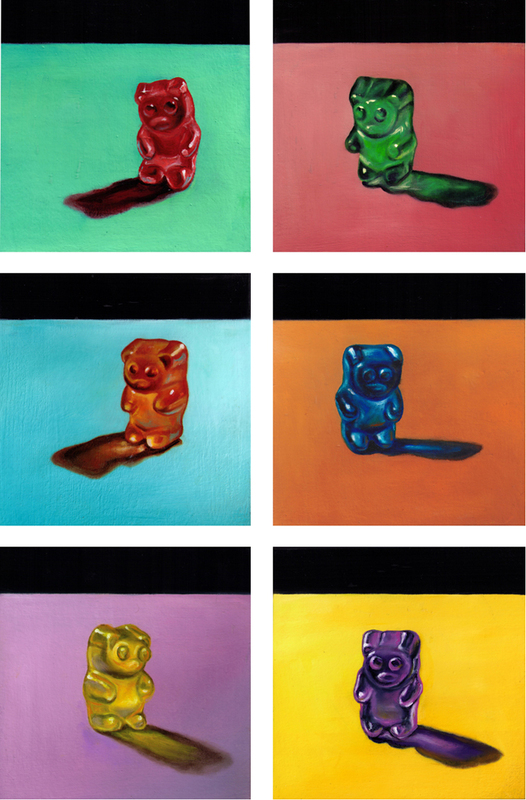 At some point along the way I figured out that if I licked the bears before I painted them, they reflected the light better and made for an improved painting. 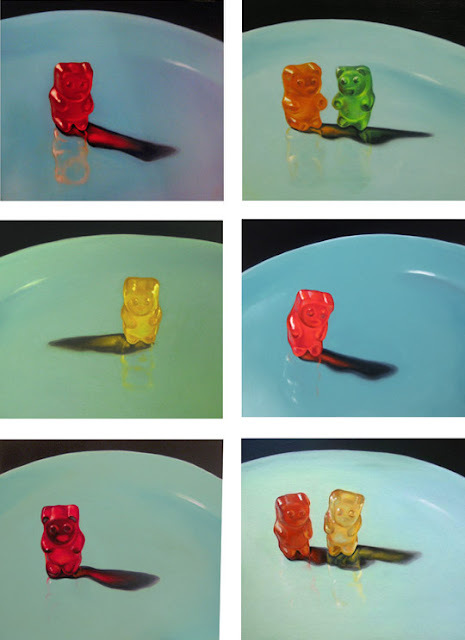 Gross -maybe, but really, aren't gummy bears meant to go in your mouth? 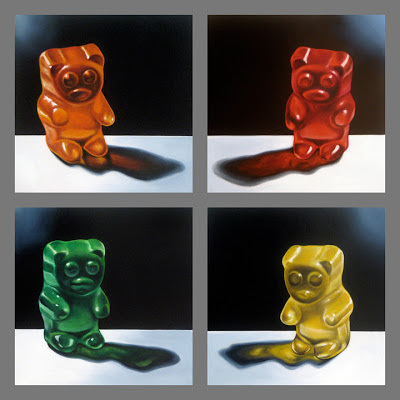 This is the finished series of the Pop Gummies, naturally there are six of them. They are (clockwise starting at top left): Hawaiian Punch, Crush (Orange and Lime), Strawberry Fizz, Cherry-Lemonade, Cherry Cola, and Ginger Ale. 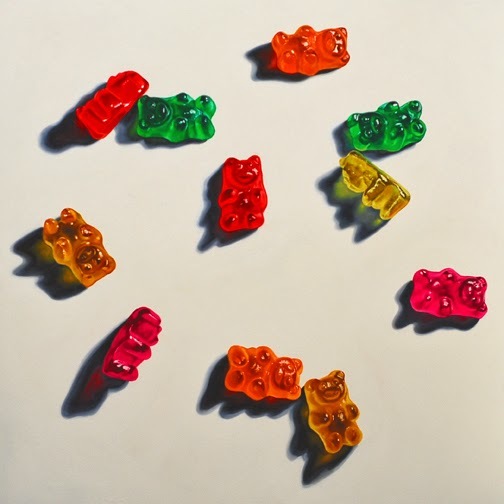 Seeing them all together, I can't help but notice what a forlorn collection of gummies they are. I guess Cherry Cola's melancholy is understandable as it is the only one that has not found a home. © Jeanne Vadeboncoeur 2011. Simple theme. Powered by Blogger.